when transplanting plants, radually acclimate your garden residents to the dimmer light conditions inside. Temperatures are dropping outside; and plants are taking notice. 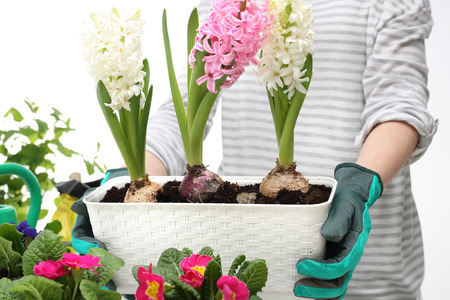 It's time to begin transplanting plants indoors - before the temperature drops below 40 degrees Fahrenheit at night. Even sooner for tropicals. Otherwise, this may be your begonia's last summer camp. You can't just pick up the pot, however, and lug it back inside. Well, you can, but that's not really smart. Gradually acclimate your garden residents to the dimmer light conditions inside. Put them in a shady spot for a day or so, then move them under an eave, then to the porch. Of course, if you're expecting frost tonight, forget acclimation and just go for it. Begin transplanting plants pronto. Chances are your geranium picked up a few buggy neighbors that you don't want to turn loose in your house. Before transplanting plants indoors, de-bug them by covering the soil with a plastic garbage bag. Wash the leaves with soapy water and rinse. This will kill most pests. Some, however, such as spider mites and scale, will need a light spraying of fine oil - a nontoxic way of killing these pests. Now that the plant's squeaky clean, it's time to concentrate on the soil. I like to repot mine when moving them back inside. Not only does this remove any burrowing insects but it also gives it a nice, fresh soil to winter in. To do this, water lightly then remove it from its pot. Is it root bound? If the roots are going round and round, the answer is yes. If so, you've got two choices: Repot it in a larger pot (don't go up more than two inches in diameter, though) or trim it back. Loosen the root ball with your fingers so that the roots are generally pointing down. If they're wound too tight, you may have to pry them apart with a dull knife. Put enough soil at the bottom of the container so that the crown (the part where it grows out of the ground) will be covered to the same depth as before. Slowly add more potting mix, gently tapping it down as you go. Water. Your plant may sink a bit in the soil. If so, pull the crown back up to the desired depth and add more soil around and under it. Water again to remove air pockets. The drill is much the same. Water, then remove it from the container. With a sharp, sterile knife, trim the roots back by one quarter to one third, then trim back the foliage accordingly. Wash the container and fill the bottom with enough soil so it will be potted at the same depth as before. Proceed as detailed above, slowly adding soil and gently patting it down. Water and adjust the soil level if necessary. Now find a new home for your post-vacationer near the brightest window. As it becomes accustomed to the dimmer light, you can move it to darker areas. Don't be surprised if it yellows a bit and drops a few leaves at first. But if it continues dropping leaves, try to find a sunnier spot. Remember that the plants won't need watering as frequently indoors. Poke your finger down into the soil and only water when dry. Cut back on fertilizer, too. I fertilize mine only every other month with a very diluted solution. Some people don't fertilize during the winter at all.